Frozen peas have completely pushed fresh peas out of stores but they remain a pleasure available to everyone with a home garden for growing vegetables. Peas have a reputation for being hard to grow in the home garden. However with the right techniques you can bring in those tender, fresh pods from your vegetable garden and discover the amazing difference between frozen and fresh! Peas are part of the Legume family of plants, so the roots have round nodules on them containing a bacteria that turns the nitrogen in the air into nitrogen compounds that plants can use for food. So peas enrich the soil and make most of their own food. This means that unlike many other vegetables they can grow on un-composted organic material. So after choosing a sunny place in your vegetable garden for some rows of peas, dig out a narrow trench – about a spade wide and deep. Throw into this trench any garden debris, kitchen waste and anything you would normally compost – even torn up newspapers. This is a great chance to clean up the garden! Put back the soil and firm it down. 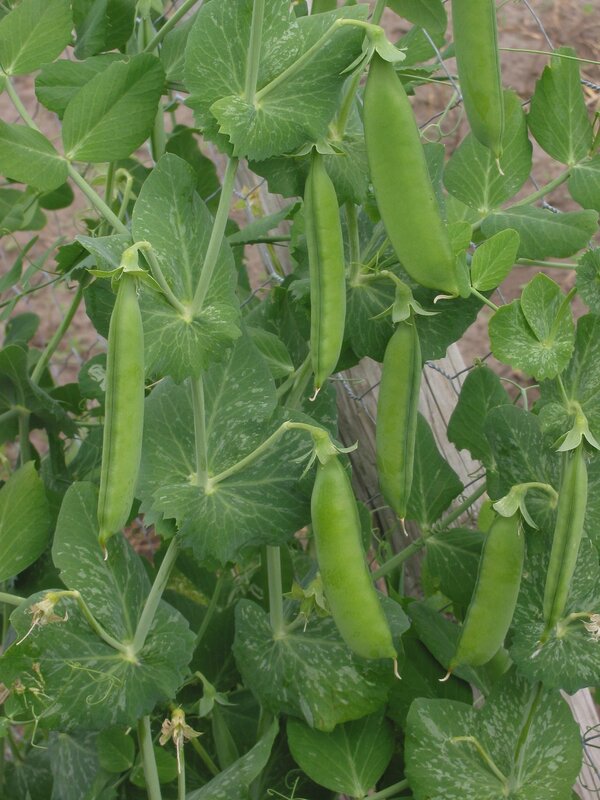 Peas need warm soil, so don’t be too quick in sowing but wait until spring is well underway. Use a hoe to make a shallow trench six inches wide and two inches deep. Water this trench thoroughly and sow the pea seeds three inches apart all over the trench. Put back the soil and firm down well. Your crop will be ready in 11 to 16 weeks depending on the variety you chose. Peas are climbing plants so they need support. Dwarf varieties like ‘Little Marvel’ just need a few branches pushed into the ground, but taller varieties, like ‘Green Arrow’ should have a netting or trellis down the middle of the row. Harvest your crop when the pods are plump but still tender. Garden peas crop over a short period and then are finished. Don’t dig up the old plants, but cut them off at ground level. This preserves the nitrogen-rich roots in the soil. This is a great location for vegetables that need nitrogen, like cabbage for example. Plant them directly where the peas were for a late crop into the fall. Growing vegetables in this way maximizes the yield from your home garden. Once in the kitchen, shell and cook your peas quickly, before their sugars turn into starch. They can be eaten raw too – young children love to open the pods themselves. They are delicious used in the classic Italian risotto, Risi e Bisi, where having fresh peas really makes something special. If your peas get a little older before harvesting, then also use some excess lettuce and young onions from your vegetable garden and make that most amazing French pea dish, Petits Pois à La Française. Eat this as a separate course with a spoon and be taken straight from your vegetable garden to heaven!